Who was a bit confused. And didn’t know what to choose. Among the dewed green ferns. And kneeled upon the earth. Joseph bowed his head to pray. And bound his tongue that day. To save him from the dark. With his face all pale and stark. Our great father and his son. Should join a church, which one? “You must not join any. 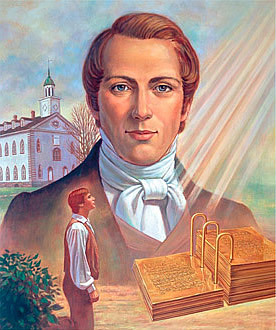 That Joseph restored our gospel. And with swiftness it still blossoms. A martyr he is called. So our church will never fall.